When Chris described the .4gram Vega spoons as too small to cast on most American spinning rigs I had to buy some if only as a curiosity. They're way more than that. This last weekend was the opening of the winter stocked trout season at the James A. Reed Conservation Area near Kansas City. The weather was grey and cold and the trout were not active. My go to stocker fly is a medium black Killer Bugger with a red bead and wire. I got nothing. I had the spoons with me and trout like spoons. I tied one on the Tenkarabum 40 with a nonslip loop knot and cast not knowing what to expect. As I should have expected the TB40 cast it just fine. In fact it was less clunky than some bead head flies. The retrieve is whatever you want it to be. A very slow steady pull produces perfect spoon action. The solid connection allows pulsing and fluttering the spoon at will. With fluorocarbon line simply sink the whole rig for a deep retrieve along the bottom. The fishing was still slow but fish were caught. 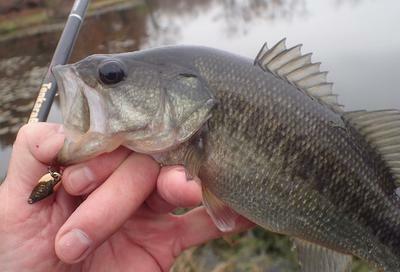 First trout of the winter and two big surprise hits from largemouth bass. For many people I'm sure this is very wrong in so many ways. In reality it's just fishing, not that different from a shiny fly with crystal flash and flexing marabou. The very traditional Heart of America Flyfishers Club has an outing in December, this is going to be so much fun. Alan, I should have tried that on the Kansas trout ponds! In retrospect, one of my best days of fishing I had in Kansas was using a ½" long crankbait on my tenkara rod at Pillsbury Crossing. The bass couldn’t get enough of it, even though it was much smaller than the woolly buggers they had been ignoring. I’ll have to make sure to start experimenting with my old Mepps spinners and mini spoons this spring. Thanks for writing your article. Excellent report! I have not fished my .4 gram spoons yet. I have been using the 2.5 gram Crusader spoons and the .8 gram Vega spoons. Now that I have my charger back (it was put in a drawer by my son's caregiver), I can get pictures again. The Kyogi rods cast the 2.5 gram Crusaders like a dream! The Suntech Genryu Sawanobori 45 casts the .8 gram spoons very well. I see from your pictures you are using the TB 40 with the .4 gram spoons. I am excited to get out and give mine a try! So far, I have only caught trout. It is nice to see that the bass and sunfish are attracted to them as well. I need to take a trip out to Red Top Pond and see if I can get a bass or sunfish to cooperate! There's a slightly-wicked streak in you, Alan. I like it! together again. I can't wait to go over the the Owyhee with him and pull out the TB 40 or Keiryu Sawanobori 63 and fish it with a spoon! He is going to go nuts! What will really make him go nuts is when you outfish him! It's fun to tease about the fly club, but in fact, they have been incredibly open and accepting of tenkara. I was asked to present a program last year. Now as far as the spoons go, I will be very quiet and discrete --- right up to the point I start catching a lot of fish. The graybeards will remember fly rod spoons. They should also remember catching fish with them. 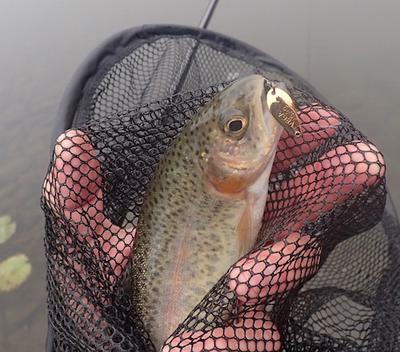 Yes, I recall buying fly rod spoons in the days of yore, but not if I caught anything with 'em. It was during my popper/sponge spider period. They must be stashed somewhere in the cellar/bottomless pit/abandon all hope ye who enter here area. I did dash down there and dug out my treasured copy of "The Trout Fisherman's Bible" by Dan Holland, copyright 1949, 1962. In it, Holland covers fly, spinning and bait casting. He has a chapter on fly rod spinner fishing using Colorado spinners which are kind of spoon-like in design and mentions in passing that the smallest spoons can be used on a fly rod. He also has a chapter on bait fishing with instructions on gathering nymphs with a kitchen strainer besides the usual worms, minnows, etc. This is an all-around book with not a bit of snobbishness in it at all. For that day and age it's quite a remarkable book when dry flies were king. Herb, a Colorado spinner is nothing like a spoon. The ones I have had were extremely simple and very light weight. A Colorado Spinner consists of two swivels, two split rings, a Colorado spinner blade and a hook. The first split ring connects the two swivels. The second split ring attaches the hook to the rear swivel. The spinner blade is attached to the front split ring, between the two swivels. The smallest ones are very light weight (1/40 oz - less if you replace the treble with a single hook) and work well as a fly rod spinner, but they are still heavier than the .4g Vega spoon and they still cause line twist. I remember fishing with my grandpa with a bamboo fly rod, and fly spoons. The only name that I remember is the "Johnson Black Minnow". I rummaged through the old tackle box that was my grandpa's, but couldn't find any. We often fished the edge of the reed beds for panfish. The most memorable fights were with Rock Bass. I did find a website that has a really corrupted combination of a fly and a spinner that looks interesting. They are called "Pistol Pete Flies." They are from Colorado, the same place as our Leader - Chris, so they must be good! Actually if you can find the propellers, you could easily tie them yourself. I am going to see if I can find some propellers. Wow are we following Chris' lead, and "corrupting traditional Tenkara!" Nobody is going to spoil my fun!!! I like to catch fish, so that is my criteria. That said, I do really enjoy all the stuff I get from JP and Paul at "Tenkara in Focus." One of their latest emails was very informative about some of the history and tradition. However, I am not paying over #360.00 for a fly box with Tenkara flies that are too expensive to see the water! For that kind of money I could buy another rod from Chris! I did buy one of the expensive "Mamushi" flies from Chris to pattern my "Rattlesnake Kebari" after. They do catch fish! To circle around, light spoons are at least an American Tradition! I would love to see some of the old patterns. There is a nice article about the old fly rod lures on the WarmWater Fly Fisher website, Les. Click on the "Classic Flies" button. Title is: "Old Fly Rod Lures: The Way We Were," written by Dennis Galyardt. Having fished what I call minimal most of the summer with worms, playing with spoons and lures is almost a 180 degree turn. I will have to check out the site you shared. I'm having fun! How about you? Is there any winter fishing in South Dakota that doesn't involve drilling a hole in the ice? By the way, you ought to grab your new SST and pay me a visit. Yesterday a guy caught a 34 inch rainbow that weighed in at 19 pounds 4 ounces out of the Boise River. (less than 10 miles from my house) A little payback for having Chris send me that teaser! The bummer is he put it on a stringer and killed it. It was a female, and I sure wish that gene pool was still in the river. Even a dyed-in-the-wool, catch-and-release fisherman would have a hard time releasing a rainbow that big! That was definitely a fish worthy of the SST 101! This also reminds me of the shad flutter spoons that they use for shad and herring on the Delaware. They are essentially just a small spinner blade with a hook soldered on, and they are far too light to be cast without shot or sinkers. There could be some potential for use with tenkara and fly rods, though. Chris, your Japanese spoons seem to be of much higher quality, but it's also inspiring a lot of crazy cross connections with my fishing past. It was a morning that was sunny and calm. Time to do some testing! I loaded the TenkaraBum 40, the Kyogi 15, the Suntech Genyu 45, and the TenkaraBum Traveler 44 in the Xterra along with my fishing buddy Frankie and headed to the Rotary Pond. I had the 2.5g Crusader spoons, the .8g Vega spoons, and the .4g Vega spoons. The Rotary pond has new docks! They have heavily planted it with trout for the fall too! The goal of the day was primarily to test rods with spoons. I used 3.5 level fluorocarbon line 13 feet long with 18 inch tippet. The Tenkara Bum Traveler was used with 6x tippet, and the others with 4x tippet. The Traveler was fished at both 40 and 44. The Kyogi can handle them all very well! The trout were landed like the Ayu fisherman in Japan! Airborne into the net! It may be the closest I ever get to Ayu fishing! Three trout on all three weights of spoons, time to switch! The .8 Vega worked OK on the Suntech Genryu and the TenkaraBum 40. I didn't even try it on the TenkaraBum Traveler. Three more trout on each. I then switched to the .4 gram Vega spoon. The .4 Spoons really shine on the Suntech Genryu Sawanobori and the TenkaraBum 40. They worked better for me at the 40 setting than the 44 setting with the TenkaraBum Traveler 44. That said, the loading with the Genryu and the TB 40 was smooth and progressive. I couldn't achieve that with the Traveler. The fish fun factor after the catch for planters, (my very subjective rating) TB Traveler 9 out of 10; 8 out of 10 for the TB40; and 7 out of 10 for the Genryu. It was too nice to go home, so I headed over to Red Top Pond. By the way these are well known pressured fishing spots, so I don't mind naming them in my reports. I do have my secret spots! I had a "worm drowner" come over at the Rotary and watch me. After my 12th fish, he couldn't stand it any longer. He walked out on the dock and asked a lot of questions about Fixed line fishing. I gave him a TenkaraBum Card! I had Red Top to myself. The Sunfish were cooperating today. Fun Factor results were the same on the Sunfish. I did notice that I wasn't catching as many little ones. I ended my session fishing the TB40 and the Genryu 45. The spoon winner among my rods is the TB 40. My goal was to test all of my "one hander" rods in the 400-450cm range. If I needed more length, I wouldn't hesitate to pull out the Genryu 45. I can't say enough good things about the TenkaraBum 40! I added a new species today with it as well. I caught a very nice Crappie. I was hoping for a bass. Some conclusions: A rod rated for 4x tippet makes a great spoon rod with the .4 Vega Spoons. At all three lengths, the TenkaraBum Traveler 44 wasn't as smooth of a caster. 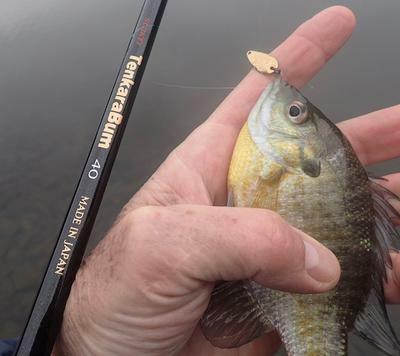 You can't go wrong with a TenkaraBum Tenkara Rod! Chris and Suntech really put together an amazing series of Rods. If you have one, give the .4 Vega Spoons a try. If you don't have one, here is your excuse to buy one! If you are looking a big fish rod that can handle spoons, the Kyogi is amazing.